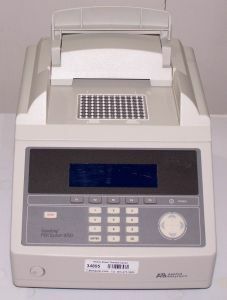 Product Description This 2010 Applied Biosystems GeneAmp PCR System 9700 is specifically designed for reliable PCR. The GeneAmp PCR System 9700 consists of a base module and one of many interchangeable sample block modules to provide you with the flexibility to meet your changing research needs. The 96-well GeneAmp PCR System 9700 is designed for use with 0.2mL reaction tubes or 96-well reaction plates for all of your routine PCR applications. The system is an ultra-reliable, highly versatile thermal cycler designed for medium to high throughput DNA and RNA applications.